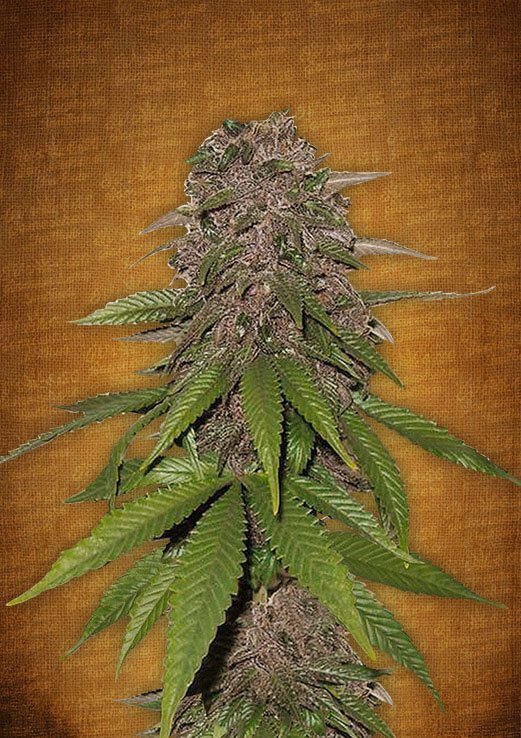 Fast Buds C-4 Matic autoflowering cannabis seeds are the result of crossing multiple purple cannabis strains in order to create the ultimate purple auto. C-4 Matic from fast buds can go from seed to harvest in as little as 7-8 weeks and will produce short bushy plants with a ton of buds. C-4 Matic gives off a buttery aroma with earthy notes and the effect is an instant body stone that will keep you relaxed for hours. Buy C-4 Matic feminised cannabis seeds now. This cannabis plant is the result of multiple crosses of several selected purple strains – a polyhybrid that will be famous for its explosive force from the time its taproot first busts out! We used genetics from a combination of high yielding and resinous strains in combination with a new variant of Canadian Ruderalis. The genetics of this plant are worthy of study – the male parent contributes a reduced flowering time, short internodal distances, and bushiness that’s typical for Indica-type plants. Meanwhile, the female parent has endowed C4 with spectacular aroma and flavor. The result is a strain of which our R and lab is more than proud of, and that harvest after harvest gratifies and delights those who endeavour to grow it. Its aroma is sensational – A hint of butter mixed with deep earthy notes. The smoke is able to instantly penetrate into your body, inducing relaxation. In a few minutes you will have a sense of wellbeing and a sudden improvement in mood. The effects are balanced between the head and body. You’ll notice the aftertaste that’s like a refreshing lemon sorbet enjoyed during midsummer. The effect can easily last for two long hours. This strain is very suitable for headaches and migraines, anxiety, stress, and muscle aches. C4 has a seed to harvest time of only 7 to 8 weeks. During this time you will see how this beautiful specimen produces compact flowers with soft green buds and orange pistils, and gradually becomes frosted with trichomes. After the second week of flowering, visible buds will develop that will rapidly fatten up week after week. Its high point begins to be evident during the last two weeks, when the plant displays a compact central cola and has an overall magnificent appearance. At this point you’ll be rubbing your hands with anticipation waiting for its final yield of no less than 650 g/m2 (1.4 pounds per light). The buds will continue to fatten quickly, and during the final stage the plant will have completed the formation of large central buds. This variety is ideal for both experienced and novice growers who desire high growth performance and good medium-high effect. Its physical resiliency makes it very resistant to pests and mold, so it is highly capable of thriving in just about any environment, and in general terms is a fine choice for growing indoors, outdoors or in a greenhouse. Put simply, this strain requires no great care, only some space and tranquillity in order to generate its compact buds, including its powerful central cola.